Signs like this appeared across Canada from August 6 to September 2; this one was on the Trans-Canada Highway in Abbotsford. Canada allows considerable latitude for free speech – unless you want to talk about abortion. Many churches and religious institutions were unable to receive Canada Summer Jobs grants from the federal government this year because they refused to attest that they agree with the state’s view of “Charter values,” “other human rights” and “access to abortion”). Pro-life students have had their right to speak curtailed on several university campuses. TransLink prevented the Canadian Centre for Bio-Ethical Reform from placing its ads on city buses in 2015 (though the BC Court of Appeal recently ruled that TransLink must reconsider its decision). 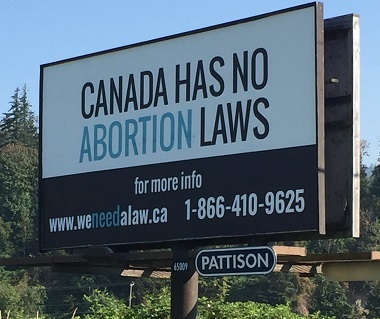 The latest chapter in this anti-anti-abortion consensus is a decision by a national “advertising self-regulatory body” against a billboard campaign by We Need a Law this summer which pointed out that Canada has no legal protection for unborn children. 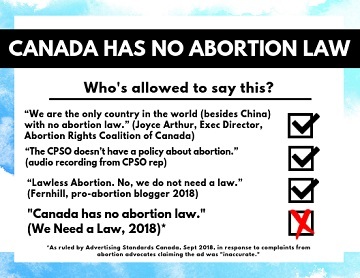 A ruling against a billboard stating, “Canada has no abortion law,” calls into question Advertising Standards Canada (ASC)’s ability to make impartial decisions. ASC, a self-regulating body that enforces the Canadian Code of Advertising Standards, ruled on the billboard after complaints were submitted with encouragement from the Abortion Rights Coalition of Canada – a pro-abortion activist organization. “This is either a biased or an ignorant ruling seemingly made at the behest of those who disagree with our pro-life views,” said Tabitha Ewert, legal counsel for We Need a Law. “Which is it? You can’t reconcile the two rulings.” Ewert said. “The irony is that pro-abortion activists often tout the fact that Canada has no abortion law, but now, when we are the ones saying it, they are using Ad Standards to censor our organization,” said Ewert. Ad Standards suggested there are “regulations imposed by Canadian authorities,” but they did not provide any sources. In fact, prior to putting up these billboards, a representative from We Need a Law called the College of Physicians and Surgeons in Ontario to clarify what abortion regulations they had in place. They were quick to point out that, “The CPSO doesn’t have a policy about abortion.” We received similar confirmation from the College in Nova Scotia. When the billboards went up at the beginning of August, the Abortion Rights Coalition of Canada took to social media encouraging people to complain, whether they had seen the billboard or not, and gave them detailed instructions on how to submit complaints to ASC. “This decision is one in a series of rulings over the years that seem to show a willingness to be used by abortion activists to censor pro-life organizations,” said Ewert. We Need a Law entered into a contract with Pattison Outdoor to install over 30 billboards across Canada this summer. Polls indicate that up to 77 percent of Canadians are unaware that Canada has no abortion laws. “That’s why we will be appealing this decision. The fact that ASC has been inconsistent in their rulings shows an organization heavily influenced by activist pressure rather than the neutral self-regulatory body they purport to be. In the past they ruled against a pro-life ad for suggesting there was a law, and now they are ruling against our message because we are saying there is no law! We hope they will recognize their error and be willing to correct it. Nothing has changed in the legal system regarding abortion in the last 10 years. Canada is still the only democracy in the world that has no protection for pre-born children at any point in a pregnancy. This inconsistency is a sad reflection on the integrity of the organization relied on to ensure fair and accurate advertising in Canada. And it needs to be made right. We Need a Law will appeal the ruling from Ad Standards and await that decision before deciding on further action. We Need a Law describes itself as “a gathering place where parliamentarians, organizations and all Canadians can come together with the shared purpose of providing a loud and clear message that we need to do all we can to legally protect pre-born children.” The group’s main office is in Ottawa, but director Mike Schouten lives in the Fraser Valley. Abortion is absolutely a religious issue. God created all people in His image, and therefore life is sacred and not to be ended based on human discretion. It is not, however, only a religious issue; it is also a human rights issue. The right to life is a fundamental right in our society, and taking it away from our most vulnerable is a strong indicator of our values as a society. A newborn child is as helpless as a pre-born child, yet we assign it legal standing and protection as soon as it has exited its mother’s womb. All Canadians can recognize and fight the injustice of discrimination based on a person’s age, ability and location. This is why we work openly with various pro-life groups from across all spectrums, as this is an issue that goes far beyond religious considerations.